The iPhone 4S looks just like the iPhone 4, but it's twice as fast. 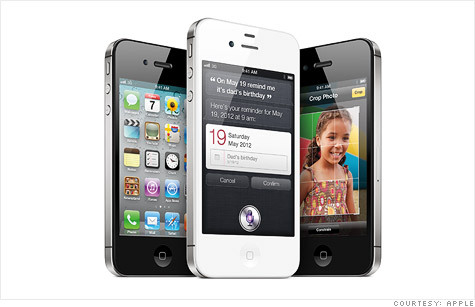 NEW YORK (CNNMoney) -- Apple on Tuesday unveiled the new iPhone 4S, the fifth update to its iconic smartphone. But many investors and analysts were disappointed that the company didn't display a more radically redesigned iPhone 5. At its Cupertino, Calif., headquarters, CEO Tim Cook took the stage to demonstrate the long-awaited device. It was the public appearance for the new CEO since he took the company's reins from Steve Jobs on Aug. 24. The new iPhone will appear physically the same as the iPhone 4, but the guts are improved: it will feature a new, faster processor called the A5, which is currently used in the iPad 2. It will also include a better, 8-megapixel camera and an improved antenna. But many industry experts focused more on what the iPhone 4S didn't include than what it did. "It was a big disappointment," said Jeff Kagan, an independent telecom and technology analyst based in Atlanta. "What we expect from Apple every year is something that shakes the earth. What we had was an incremental improvement from what we had last year." Shares of Apple (AAPL, Fortune 500) fell by as much as 5% Tuesday before recovering and closing down a half percentage point. Many blogs and news articles cited component distributors as saying that Apple would unveil a completely redesigned "iPhone 5" device with a larger screen, 4G radio technology, an aluminum casing, a teardrop contour and no home button, among other rumors. Kagan faulted Apple for letting rumors and speculation run rampant. Part of the problem, he said, was that Apple decided to hold a national news conference. In the past, Apple has unveiled groundbreaking products practically every time it has gathered the media. "There's nothing wrong with a company coming out with an incremental improvement, but with a big news conference comes the expectation of something big," he noted. "This wasn't big." The announcement comes at a crucial time for Apple in the mobile space. Google's (GOOG, Fortune 500) Android operating system, which runs on over 100 mobile devices around the globe, has grown to more than double the iPhone's share of the smartphone market, according to Gartner. Apple is closing in on No. 2 Nokia (NOK), but the Finnish company is expected to make a big push back into the United States after it unveils its first Microsoft (MSFT, Fortune 500) Windows Phone devices later this year. Meanwhile, Research In Motion (RIMM) is in the middle of a refresh of its BlackBerry lineup. App developers are still largely favoring Apple's iOS operating system, since it also runs on the iPad and iPod Touch, in addition to the iPhone. That has given Apple the opportunity to boast that it has the most applications available for its devices. But that could change, as the iPad is also soon to face pressure. Amazon (AMZN, Fortune 500) last week unveiled its new Kindle Fire tablet, which will run on the Android operating system and undercut the iPad's lowest selling price by $300. Some analysts said the iPhone 4S is enough simply to put Apple in a holding position in the fiercely competitive market. "A lot of people have been holding out for this phone, so there will be pent-up demand, but I don't think the lines will be nearly as long," said Jagdish Rebello, principal analyst of communication systems at iSuppli. "It won't blow the roof off sales. Apple will expand its place in the smartphone space, but at a much slower rate than if it had unveiled a dramatic new product." Rebello said the real innovation of the iPhone 4S comes in the software, particularly Siri, a voice recognition software that will read out answers to queries. The product of a startup Apple bought in April 2010, the company showcased Siri as a quasi personal assistant that can search the Web, take notes and answer simple questions. But the software upgrade will also come to some previous versions of the iPhone, giving some current customers less of a reason to run out and upgrade. Still, many noted that Apple's announcement wasn't a disaster. There were some big announcements: The new device will go on sale in the United States Oct. 14 on the AT&T (T, Fortune 500), Verizon (VZ, Fortune 500), and -- for the first time -- Sprint (S, Fortune 500) networks. The iPhone 4 will get a price cut to $99, and the iPhone 3GS will be offered for free with a new contract, opening up the iPhone to a new set of price-conscious customers. "Most consumers don't read gadget blogs, they just go to the Apple store, and they buy iPhones," said Michael Gartenberg, analyst at Gartner. "There are lots of reasons why existing customers will want to upgrade. This is an evolutionary design with a a lot of revolutionary features." It's been 15 months since Apple's iPhone 4 went on sale, making this lag between new models the longest since the iPhone debuted in 2007. Apple has typically unveiled its new iPhone at its Worldwide Developers Conference in June. But this year, Steve Jobs reserved that time to preview the company's new software, including the iPad and iPhone's iOS operating system, the new Mac OS X Lion operating system, and iCloud. Despite the delays in launching a new version, demand for the iPhone 4 has remained insatiable. Apple sold a record 20 million of the devices in the second quarter, and early analysis points to another record quarter over the past three months. A recent RBC Capital survey suggested sales of the new iPhone would likely top those of the record-setting iPhone 4. "Consumers are still buying the iPhone 4 in large quantities," said Gartenberg. "It's hard to name many phones on the market that are more than 1 year old, never mind sell them." The fall is also when Apple has traditionally updated its iPod lineup, so company announced that it's refreshing both the Nano, which will go on sale Tuesday, and the iPod Touch, which will launch on Oct. 12. The Nano got improved navigation with finger swipes, and the price was reduced: $129 for the 8-gigabyte model and $149 for 16 GB. The Touch will come in white, it will run the new iOS 5 software, and the cost was lowered by $100 -- starting now at $199 for the 8 GB model.